“It’s a Wonderful Life!” was the theme for the wonderful holiday party given by the Flower and Fruit Mission of Saratoga Hospital at the Hall of Springs on Dec. 7. In the Frank Capra classic film, George Bailey is despondent when his beloved Bedford Falls is transformed into Pottersville. Saratoga Springs today still has the small-town spirit and sense of community of a Bedford Falls. For 109 years, the Flower and Fruit Mission has served maternity patients at Saratoga Hospital. Its 35 active and 11 associate members have raised over $1.25 million for heart monitors and other equipment, nurse scholarships, and renovation of patients’ rooms. The December dance has been a tradition for more than half a century. 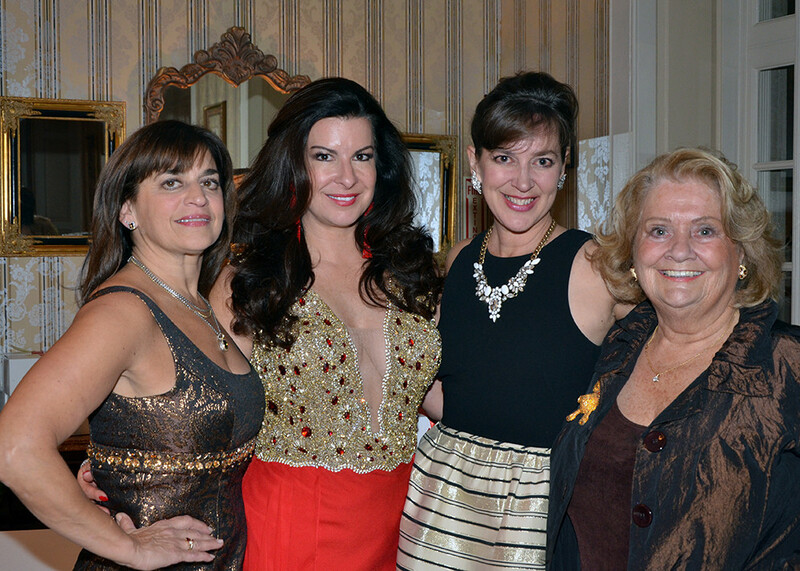 This year’s “Annual Snowball at the Hall”—chaired by Christa Lance, Gloria Griskowitz, Julie Bonacio and Marlene Okby—raised about $30,000. “We had a really good year; we worked really hard. It’s a really good number,” said Okby. President Amy Sutton, there with husband Rod, welcomed the crowd. Holly Sofarelli, who handled reservations, and husband Dr. Bob Sofarelli, a veterinarian, posed for a photo with Santa Claus, as did Charlene Wood Courtney, Heather Mabee, and others in the holiday spirit. It was a family affair. District Attorney Jim Murphy and wife Laurie were greeted at the door by daughter Claire Murphy and Emily Zihal, who sold boxes of cookies made by Flower and Fruit members. Other Saratoga High National Honor Society students helping out were Chris Engborg, Mike Gyarmathy, and Max Lynch. Kyran and Tina Nigro’s son Kyran, of Albany Academy, and Sonny and Julie Bonacio’s daughter Gianna were among the coat checkers with reindeer antlers, who included Annie Crotty, Emily and Tess Turner, Avery Schaap, and Katie Silver, also of Saratoga Middle School. The girls took a break and livened up the dance floor. Tina’s parents, Frank and Delores Parillo, also attended, and sat with Delores’ sister, Jan Chesterton, partner Wayne Orlosky, and former neighbors Larry and Marie Zinter. Mylea Aldrich, there with husband Buzz; Colleen Carlson, with husband Skip; and Barbara Ferraro, with husband Steve, welcomed guests at the door. Sonny Bonacio was auctioneer for a Yankee-Orioles game package: Lisa and Tim Higgins were high bidders at $5,000. Mike and Linda Toohey won tickets to Bow Tie Cinemas, and Andi and Chris Dolinski won a basket of wines. Newly-elected Wilton town councilman Joanne Klepetar and husband Dr. Tom Klepetar attended. It was the last dance as mayor for Scott Johnson and his wife Julie, who shares a birthday—and shared a cake—with Kate Calbone, wife of Saratoga Hospital CEO Angelo Calbone. Dr. Charles Richman and wife Katie, Linda and Don Snyder, Marcia and Jerry MacDonald, and Vicki and Steve Merola were among the partiers. Kate and Mike Naughton, Jean Tarrant, Sue and Wally Allerdice, Lisa and Joe Torani, and Dutch and Kathy Hayward also attended. Britt and Erik Dittrich, Suzanne and Greg Grande, and Nancy and Tom Burkly were among those on the packed dance floor. The Audiostars, which includes original members of The Refrigerators and Burners U.K., entertained the crowd, after performing at the Saratoga Springs History Museum gala the night before.